This article is about the Mexican city. For the Bolivian seat of government, see La Paz. La Paz (pronounced [la ˈpas] ( listen), Peace) is the capital city of the Mexican state of Baja California Sur and an important regional commercial center. The city had a 2015 census population of 244,219 inhabitants, making it the most populous city in the state. Its metropolitan population is somewhat larger because of the surrounding towns, such as El Centenario, Chametla and San Pedro. It is in La Paz Municipality, which is the fourth-largest municipality in Mexico in geographical size and reported a population of 290,286 inhabitants on a land area of 20,275 km2 (7,828 sq mi). Location of La Paz in Baja California Sur. Location of La Paz in Mexico. The population of La Paz has grown greatly since the 2000s. The growth is largely because the city has one of the highest standards of living and security in Mexico. La Paz is served by the Manuel Márquez de León International Airport with flights to the most important cities of Mexico: Mexico City, Guadalajara, Monterrey. Airlines flying into La Paz include Aeroméxico Connect, Volaris and VivaAerobus. Two ferry services operate from the port of Pichilingue outside the city, connecting the Baja California peninsula to the mainland at Mazatlán and Topolobampo, near Los Mochis. La Paz was first inhabited by Neolithic hunter-gatherers at least 10,000 years ago who left traces of their existence in the form of rock paintings near the city and throughout the Baja California Peninsula. Fortun Ximenez piloted the Concepcion into the bay in late 1533. He and twenty-two of his crew were killed by the native population. On May 3, 1535, Hernán Cortés arrived in the bay by La Paz and named it "Santa Cruz"; he attempted to start a colony but abandoned his efforts after several years due to logistical problems. In 1596, Sebastián Vizcaíno arrived, giving the area its modern name, La Paz. From January 10, 1854, to May 8, 1854, it served as the capital of William Walker's Republic of Sonora. The project collapsed due to lack of US support and pressure from the Mexican government to retake the region. Rainfall is minimal at most times of year, although erratic downpours can bring heavy rains. Rain tends to be concentrated in a short, slightly rainier season that peaks in August and September, following the pattern of the North American Monsoon. The driest season, where it is common to have no rain, occurs March through June. La Paz averages over 300 days of sunshine annually and an average of 3148 sunshine hours. As with most of the Gulf of California, the temperature of the water changes substantially over the course of the year, with temperatures around 68 °F (20 °C) during winter and around 85 °F (29 °C) during summer. The population of La Paz has grown greatly since the 2000s. Eco-tourism is by far the most important source of tourism income in La Paz. Tourists also visit the city's balnearios. There are some 900 islands and inlets in the Gulf of California with 244 now under UNESCO protection as World Heritage Bio-Reserves and the Isla Espíritu Santo group, which borders the northeast portion of the Bay of La Paz, the primary tourist destination of the area. Industries include silver mining, agriculture, fishing and pearls. Tourism is also an important source of employment for this coastal community. Along with the area's marinas, new developments are emerging because of the proximity to the United States. When Aero California existed, its headquarters were in La Paz. Running along the coast in front of La Paz is 5 km (3.1 mi) long Malecon Road. The main purpose of this road is to allow easy movement across the city. However, it quickly became the focal point of tourist related activities with a large number of bars, restaurants and shops opening along its length. Since 2004 extensive development has taken place which included a large sidewalk which offers safety for large numbers of people to walk along the coastal front of La Paz. In September 2011, a bicycle lane was added to Malecon Road, providing cyclists protection from cars and pedestrians. The city had a 2015 census population of 244,219 inhabitants, making it the most populous city in the state. Its metropolitan population is somewhat larger because of the surrounding towns, such as El Centenario, Chametla and San Pedro. 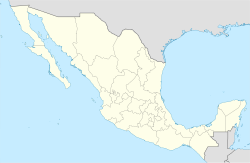 Its surrounding municipality, which is the fourth-largest municipality in Mexico in geographical size, reported a population of 290,286 inhabitants. La Paz is the state capital and center of commerce, as well as the home of the three leading marine biology institutes in Latin America (UABCS, CIBNOR & CICIMAR), largely because it sits on the Gulf of California, which is home to exceptional marine biodiversity. It also supports several other university-level institutes of learning, such as the Universidad Autonoma de Baja California Sur. The city is also the setting of the 1967 Scott O'Dell children's novel The Black Pearl, chosen as a Newbery Honor Book in 1968., where La Paz is the home of the main character. ^ a b c d e "Data" (PDF). www.saludbcs.gob.mx. ^ (in Spanish) Los Municipios con Mayor y Menor Extensión Territorial Archived 2007-03-03 at the Wayback Machine, Instituto Nacional Para el Federalismo y el Desarrollo Municipal, SEGOB (Mexico.) Accessed 15 February 2008. ^ P.38 footnote 12 "The Land of Sunshine Vol. 11 No. 1"
^ Chapter 2, vol. 1, History of California, Theodore Henry Hittell, San Francisco: N. J. Stone & Company, 1897. ^ "La Paz, Baja California Sur Travel Weather Averages". Retrieved 16 June 2017. ^ Ltd, Copyright Global Sea Temperatures - A-Connect. "La Paz Sea Temperature January Average, Mexico - Sea Temperatures". World Sea Temperatures. Retrieved 22 March 2018. ^ "NORMALES CLIMATOLÓGICAS 1951-2010". Servicio Meteorológico Nacional. 2012. Retrieved 1 March 2017. ^ "Extreme Temperatures and Precipitation for La Paz (DGE) 1940-2010" (in Spanish). Servicio Meteorológico Nacional. Retrieved 6 May 2015. ^ "NORMALES CLIMATOLÓGICAS 1981–2000" (PDF) (in Spanish). Servicio Meteorológico Nacional. Archived from the original (PDF) on 25 April 2015. Retrieved 6 May 2015. ^ "CLIMAT summary for 76405: La Paz, Bcs (Mexico) – Section 2: Monthly Normals". CLIMAT monthly weather summaries. Ogimet. Retrieved 20 January 2019. ^ "Directory: World Airlines". Flight International. 2007-03-27. p. 46. ^ Steinbeck, John (2000). The Log from the Sea of Cortez. London: Penguin. pp. 84–105. ISBN 978-0-14-118607-8. ^ Newbery Medal and Honor Books, 1922-Present Archived 2008-02-18 at the Wayback Machine, ALSC, American Library Association. Accessed on line 15-II-2008. 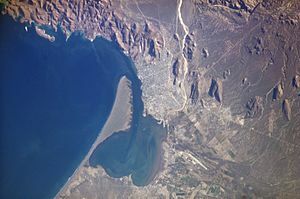 Wikimedia Commons has media related to La Paz, Baja California Sur. Wikivoyage has a travel guide for La Paz (Mexico).